First Impression Your first impression is "Wow, this beginning sequence takes a long time! And look at the crappy graphics!" then, after you press a button, you think "How the heck do you select things in this menu!?!?" 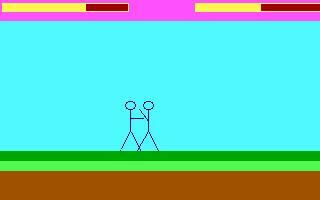 After you figure that out, you see the extremely crappy graphics, and try to figure out how to move. Ten minutes later, you move over a little bit! Wow! What It's Like There are two stick figures standing on the sides of the screen. Wow. Well, after you figure out the keys, you two attack each other. Only one person can move at a time since it only accepts one key press at a time. Since you don't have anyone playing with you, you go kill the other person. The end. Other things you should know This game has a simple, okay story. You are a guy who was framed for killing 'Joe Melzer'. The police try to arrest you, and you attack each other. This also has a html file that tells you the keys. There is also a second version in Italian! Graphics Junk. That's all that can explain it. They are stick figures with a couple squares in the background. Ooohh... Wow. Sound This game has half decent speaker music. I kind of like it, and it's not annoying. It's only played in about one tenth of the game. Gameplay/Control Crappy job. It's tough to find out what the keys are and to figure them out. Or you can use the readme file, but you'll have to write them down for reference. Also, only one person can press a key at a time, which means that the first to press a key wins, basically. Overall Impression Very simple and crappy. It looks like it was made in three minutes. Bad graphics and stuff, but there's a translation in Italian, and you can learn from the code if you're a newbie.